To understand the functions of individual proteins in complex biological systems, it is often necessary to measure changes in protein abundance. For example, Biomarker discovery and validation studies typically require quantitative analysis of proteins to identify and verify potential biomarkers that show protein expression changes significantly between different states/conditions. 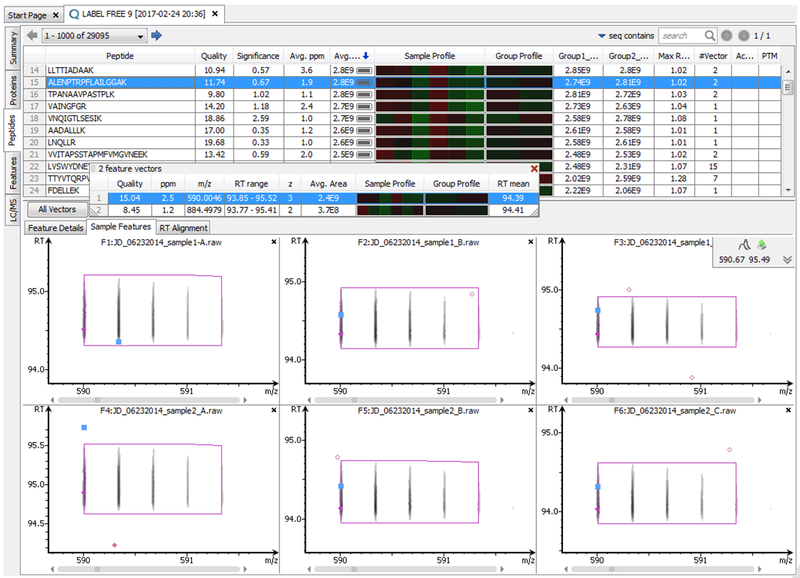 PEAKS Q allows the scientist to determine relative protein abundance changes across a set of samples simultaneously by labelling or label-free quantification using LC-MS/MS. Stable isotope labeling using amino acids in cell culture (SILAC) is a powerful method to identify and quantify relative differential changes in complex protein samples. It has become the most common approach for in vivo isotopic labeling and popular method for quantitative proteomics. The PEAKS Q module in PEAKS Studio 8.5 adopts 1) enhanced SILAC feature pair detection algorithm, and 2) SILAC alignment and ID transfer techniques to successfully improve the quantification accuracy and sensitivity. It uses ratio-focused quantification, which enables the data analysis for super-SILAC experiments. It enables applications such as time series quantification by introducing multiple group comparison. This new PEAKS Q module also implements paired t-test and Welch’s ANOVO for single-group analysis and multi-group comparison, respectively. 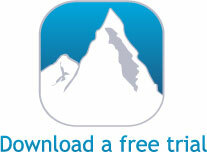 Click HERE for more details of SILAC-based quantitative proteome analysis with PEAKS. Protein relative quantification in PEAKS is performed using ion peak intensity on MS1. In label-free quantification experiments, samples are separately collected, prepared and analyzed by LC-MS/MS. Because of the large amount of data collected from these experiments, sensitive and accurate algorithms are used in PEAKS for automated ion peak alignment and comparison. Peptide/protein identification from MS2 by database search is integrated for protein quantification. PEAKS Studio 8.5 selects the three most abundant unique peptides for protein ratio estimation by excluding 1) peptides with both modified and unmodified forms, and 2) redundant peptides. Same peptide ions from different LC-MS runs are aligned. Ions with different charges are merged. Different approaches to the t-test or ANOVA are required for robustly comparing pairs of independent or related samples. When a large number of tests are performed, P values are interpreted differently for more accurate estimation of false discovery rate (FDR). Three most abundant peptides are used for protein ratio estimation. Isobaric tags (TMT or iTRAQ) have identical masses and chemical properties that allow heavy and light isotopologues to co-elute together. The tags are then cleaved from the peptides by collision-induced dissociation (CID) during MS/MS, which is used for quantification. One of the challenges for such methods is reporter ion ratio distortion resulting from fragmentation of co-isolated interfering species. The MultiNotch MS3 method addresses this issue by uniquely combining multiplexing capacity with quantitative sensitivity and accuracy. PEAKS supports both MS2 and MS3 quantification. With PEAKS, you can now expand your sample size for large-scale protein quantification studies, with reference channels to ensure the accuracy of quantification. Yang, W., et al. 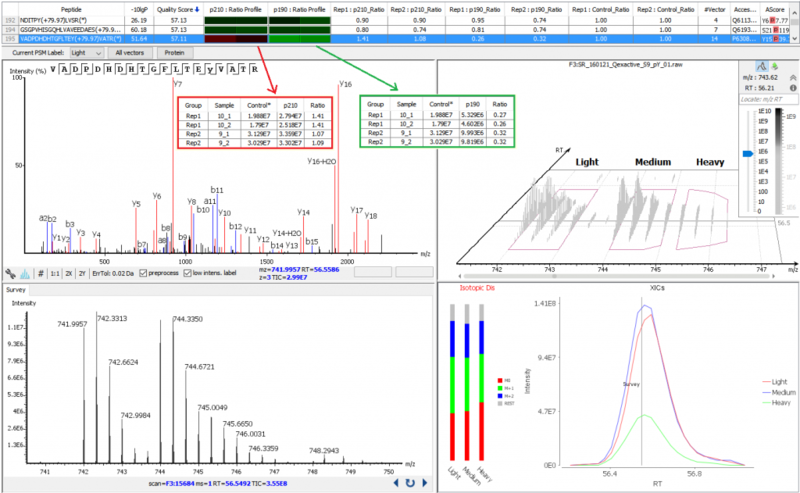 PEAKS Q: Software for MS-based quantification of stable isotope labeled peptides. ASMS. WP531. 30/5/2006. Xin, L. et al. 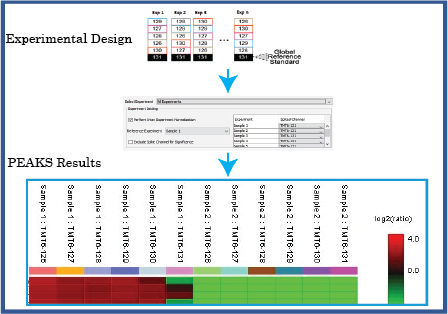 New Quantitation Software Package Based on PEAKS Protein ID. ASMS. TP 653. 2/6/2008. Chen, C., et al. New Algorithm for Label-Free Protein Quantification. ASMS. MPB 043. 31/05/2009.